Application Form for MMMUT Admission Test 2019 has been released. Eligible candidates can fill the application form carefully. The MMMUT Admission 2019 in different undergraduate and postgraduate programmes in the Madan Mohan Malaviya University of Technology, Gorakhpur will be made through the MMMUT Admission Test 2019 and after that, the entrance exam will be held then according to the exam’s merit list. MMMUT Counselling will be conducted under the supervision and control of the University Admission Committee (UAC) for the academic year 2019-20. The UAC has authority for conducting the admission process, and to decide about modalities of admissions, allotment of seats and all matters related to the admission in the University with the approval of Vice Chancellor, MMMUT, Gorakhpur. Latest: MMMUT released revised dates of Malaviya Entrance Test(MET) 2019 for UG and PG programmes admissions. Scroll down to check the same. 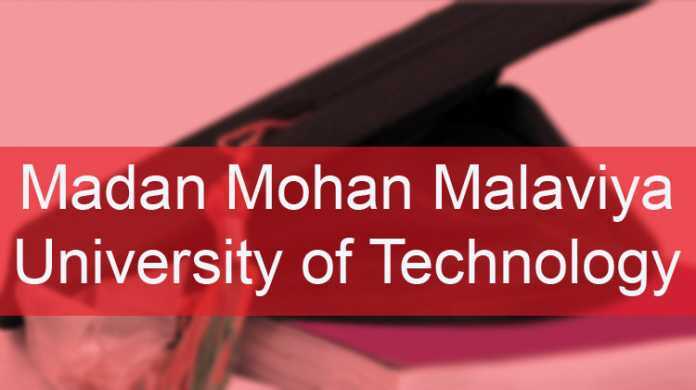 Madan Mohan Malviya University has released the Malaviya Entrance test MET-2019 related information.The admissions will depend on the entrance exam’s score. The candidates can get the information from the page. The important dates related to Malaviya Entrance test MET-2019 has been given below. View here the Schedule of Malaviya Entrance test MET-2019. The candidates who are interested in taking the admission in MMMUT and are fulfilling the eligibility criteria can fill up the MMMUT Application Form. The candidate has the option to submit his/her application for Malaviya Entrance Test either by OMR application form mode or On-line application mode. The candidate must himself/herself ensure his / her eligibility to appear in the MMMUT Admission Test. The details of the eligibility conditions are given below. Admission is open to the Indian Nationals who have passed/appearing in the qualifying examination from any institution located in UP or whose parents (Father or Mother Only) are domiciles of U.P. and they have passed/appearing in the qualifying examination from an institution located outside U .P. The reservation policy as prescribed by the U.P. State Government shall be applicable in admissions. The candidates shall have to provide evidence of fulfilling the eligibility criteria as given herein at the time of document verification. B.Tech. : For admission to first year of B.Tech., the candidate should have passed 10 + 2 examination with at least 45% marks ( 40% in case of candidate belonging to SC/ST category) and also with at least 50% marks (45% in case of candidate belonging to SC/ST category ) in Mathematics, Physics and Chemistry each without grace. Diploma holders: Passed 3/4-year Diploma examination from an Institution recognized by U.P. Board of Technical Education in any branch of Engineering/ Technology except Agriculture Engineering with at least 60% marks (55% in case of candidates belonging to SC/ST category) without grace. B.Sc. graduates: Passed 3/4-year B.Sc. Degree from any recognized University of India as defined by UGC with at least 60% marks (55% in case of candidates belonging to SC/ST category) without grace and having passed 10+2 exam with Mathematics as a subject. Admission test will be open to the Indian Nationals who have passed/appearing in the qualifying examination, fulfilling the eligibility requirements given below. The weightage for Admission Test and valid GATE score shall be 40% and 60% respectively. However, the preference shall be given to the candidates having domicile status of U.P. state and subsequently, the candidates having domicile status of outside U.P. will be considered only if seats are vacant. The reservation policy as prescribed by the U.P. State Government shall be applicable in admissions. Candidates applying under sponsored category should possess the working experience of minimum two years in industry/organization and shall be required to provide Sponsorship Certificate from sponsoring organization/industry at the time of counseling, however, the admission to such candidates shall be offered only on the vacant seats, if available. Civil Engineering Environmental Engineering First Class B.E./B.Tech or equivalent Engineering Degree in Civil/ Environmental / Chemical / Structural/ Agricultural/ Construction Technology /Construction Technology and Management or equivalent CGPA as specified by AICTE. Electrical Engineering Power Electronics & Drives First Class/Division in B.E./B.Tech or equivalent Engineering Degree in either Electrical Engineering (EE) or Electrical and Electronics Engineering (EN) or equivalent CGPA as specified by AICTcE. The University may admit candidates to Ph.D. programme who have qualified a National Level test which entitles them for the award of Senior/Junior Research Fellowship/ any other Fellowship without appearing in the University’s Ph.D. Admission Test provided that they fulfill the eligibility norms of the University ordinance. Such candidates will be selected on the basis of personal interview. The University may also admit its M.Tech. pursuing students well in advance to Ph.D. programme in an integrated fashion who have qualified a National Level Test which entitles them for the award of Senior/Junior Research Fellowship/ any other fellowship without appearing in the University’sPh.D. Admission Test provided that they fulfill the eligibility norms of the University ordinance. After filling up Application forms successfully, there will be MMMUT 2019 Entrance Test. Admission Test will be of objective type. The candidates are required to opt suitable paper(s) for appearing in the entrance examination. Every objective type question would carry four marks for the correct answer. Each objective type question shall have one correct answer. The answer would be considered correct only if the appropriate choice is indicated in the answer. There will be negative marking of 1 mark for each wrong answer. A record of incorrect answers given by a candidate will be kept separately. All objective type questions are required to be answered on specially designed OMR answer sheets against the respective question number. Answers are to be marked using ball point pen (Black/Blue) only. For the purpose of evaluation, the details filled in by the candidate in the OMR answer sheet will be accepted as final. Note: In case of non-availability of Hostel the hostel Fee component as applicable shall be refunded to the candidate. The above structure may be revised by the University/UP Government directives from time to time.